Introduce little ones to the wonders of nature with comfort and ease! 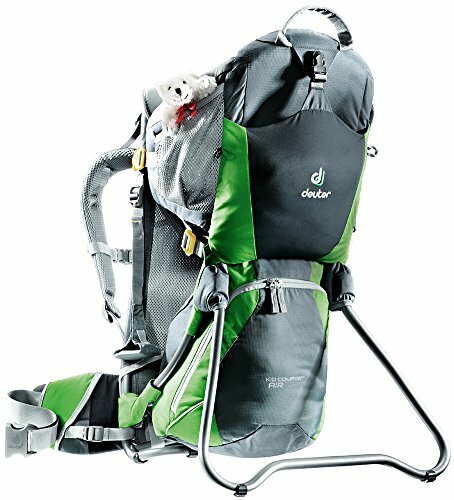 The Kid Comfort Air leverages all of the design expertise behind Deuter's Kid Comfort series and takes another step ahead of the curve. Featuring an AirComfort back system to keep the captain cool and comfortable, the carrier itself keeps your little adventurer snug, well-ventilated, and ready for hikes that will instill a lifelong love for the outdoors. JPMA certified for safety, this child carrier is ideal for kids who weigh between 16 and 40 pounds who can sit up by themselves. FEATUES & SPECS - 2 grab handles make pack easy to lift without assistance; Variety of storage solutions including large zip compartment under seat; Height adjustable child seat with variable width to support healthy posture; Includes teddy bear; Weight Limit: 48.5 lbs (22kg). Volume: 14 L. Item Weight: 6lb 3oz (2.8kg). Dimensions: 28 x 17 x 13 in. Material: Microrip-Nylon / PU Coated Super-Polytex.